Elizabeth Alexandra Mary Windsor was third in line for the throne at her birth, but it was generally assumed that she would never get that far. Her uncle was a handsome young prince, who would no doubt marry and beget a male heir long before the crown should come to her. She was nine years old when her grandfather King George V died, and the crown passed to her uncle, King Edward VIII, but he was pressured to either give up the throne or give up his plans to marry a twice-divorced American, Wallis Simpson. He chose the woman, abdicating the throne less than a year after his father's death. Suddenly Elizabeth's father was no longer the stuttering, knock-kneed Prince George, but King George VI, and Elizabeth was no longer just a royal princess, she was heir to the throne. Her parents, who had tried to give their daughters a somewhat -- by royal standards -- ordinary upbringing, started handing her newspaper articles about political matters, and arranged for her to receive lessons on the history of the British constitution. She was home-schooled in the palace by a governess, Marion Crawford, who was called Crawfie by Elizabeth and her younger sister Princess Margaret, and who later wrote a book about raising the royal daughters. In the book, the governess told about confiding to 13-year-old Elizabeth that she yearned to marry, but that the palace would not approve, to which the princess replied, "'You must see, Crawfie, that it would not be at all convenient just now.'" Crawford stayed in her job, unmarried, until Elizabeth was 21. At 16, as World War II raged, she asked her father if she could serve as a volunteer nurse in bombed-damaged London, but he thought it was too dangerous. She persisted in asking, and when she was 18 he allowed her to volunteer with the Auxiliary Territorial Service, where she was trained to drive and repair heavy transport vehicles, although she was not allowed to do much of the actual driving and repair work. Her first crush was on her distant cousin Prince Philip of Greece, and at 20 they were engaged, against her father's vehement wishes. There was nothing wrong with Philip, he argued, but she was far too young to consider marriage. Again she was able to wear down her father's resistance, and Philip and Elizabeth were married after he renounced his Greek citizenship and title. 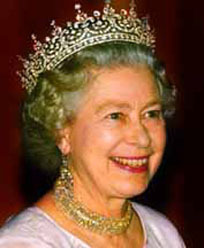 Four years later, while on a visit to Kenya, she received word that her father had died, making her Queen Elizabeth II. As a perk of royalty in the United Kingdom, she is head of state in all the Commonwealth Realms, meaning she is also Queen of Antigua and Barbuda, Australia, the Bahamas, Barbados, Belize, Canada, Grenada, Jamaica, New Zealand, Papua New Guinea, Saint Kitts and Nevis, Saint Lucia, Saint Vincent and the Grenadines, the Solomon Islands, and Tuvalu. The duties of Queen are largely ceremonial, but Elizabeth has always conducted herself with dignity, and she was Time Magazine's Woman of the Year in 1952, for providing "a quiet, well-behaved fairy tale in which the world could believe." She insisted that her children attend ordinary schools, although the royal definition of "ordinary" means they were sent to swanky private schools, and years later she was clearly pained by the assorted scandals and divorces among her children. In 1992, she quietly acquiesced as Parliament passed laws that, for the first time, taxed the royal family's enormous wealth. The Queen is something of an animal nut, owning and breeding race horses and tending to, at last count, ten dogs, including Labradors, Spaniels, and her favorites, the Corgis. When she is in the palace, she reportedly feeds and grooms the dogs herself, and she has crossbred Corgis and miniature Dachshunds to create pups the royal press office calls a new breed of dog, the Dorgi. When a reporter once asked how the short-legged mini-Dachshunds manage to mate with the much-taller Corgis, the Queen replied, "Oh, it's quite simple. We have a little brick."